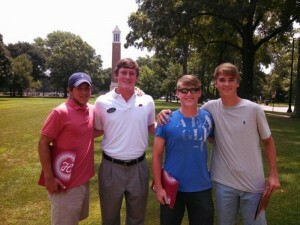 Unveiled in July 2003, the DISCOVERING BAMA campus visit program is a uniquely personalized experience available to high-school students and their parents interested in knowing more about The University of Alabama. The Discovering BAMA program offers prospective students an individualized campus visit that is tailored to their specific interests. Each schedule varies, but most visits include a campus tour, lunch with a current student, and meetings with an academic advisor in their intended field of study. Discovering BAMA is offered Monday-Friday and we ask for at least two weeks notice to complete scheduling. A typical visit will last around four hours between 8:30 a.m. and 4:00 p.m., depending on the student. Due to a high volume of visits, we ask that you provide a first and second choice for your visit date. Discovering BAMA students must be recommended by a current member of the National Alumni Association. Please allow our office two weeks to process your request, verify your membership, and contact the student for more details.